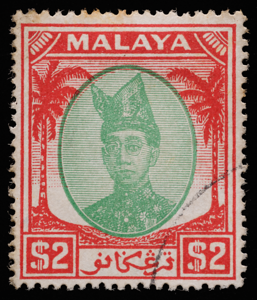 By the time of the post-war Malay state issues, monochrome values were generally printed using single plates. 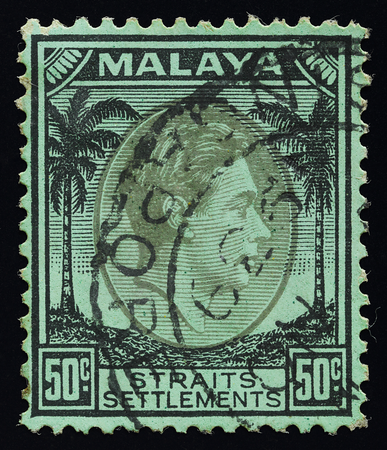 The 20-cent blue was an exception, having been printed in black and green previously (see the Kedah quirk). 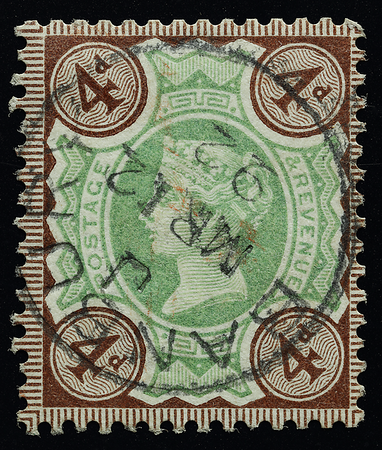 Occasionally the inks used for the key and duty plates were of slightly different shades (above). 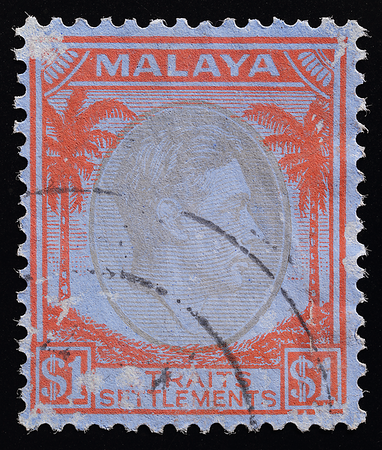 More examples can be seen in the BMA Malaya 1 cent black and 2 cents orange Die I. 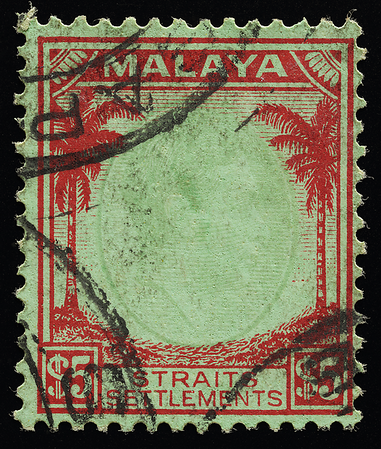 The true bicolours—high denominations—of the coconut definitive exhibit a kaleidoscope of colour combinations, some inherited from pre-war stamps of the Malay states. The colour pairs are of varying proximities on the colour wheel (centre) from near-adjacent (left) to directly opposite (right). The $2 green-and-red has the unique distinction of an exclusive denomination-colour pairing that lasted the lifetime of the coconut definitive. Like the tonal nuances and contrasts of orchestral instruments in a Beethoven symphony, the bicolours range from sombre to exuberant, feminine to masculine, subtle to brazen. 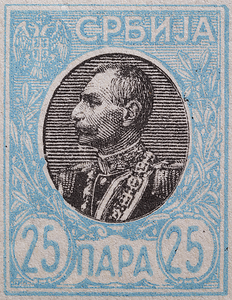 Multicolour registration was a mark of craftsmanship in artistic letterpress printing in the late 19th century (Clouse & Voulangas 2009), and the choice of colours was hotly debated in the trade. 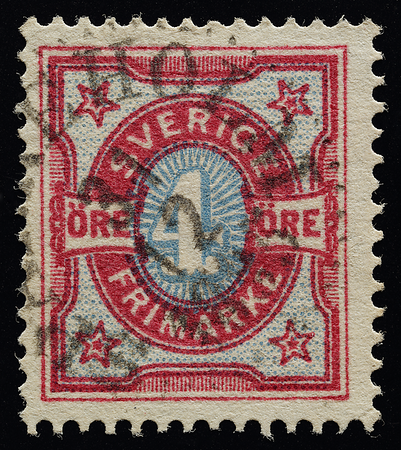 Bicoloured stamps were not always appreciated though; the first such stamps in the US in 1869 were widely seen as garish at the time. 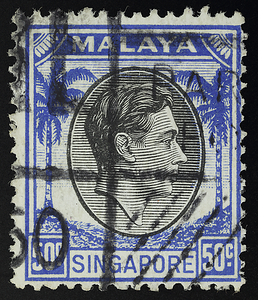 The author himself has spoken to an individual who finds the bicolours jarring. 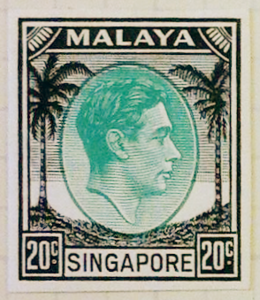 This variant of the $1 tricolour (left) with a pale olive vignette has not been documented even in specialized catalogues. 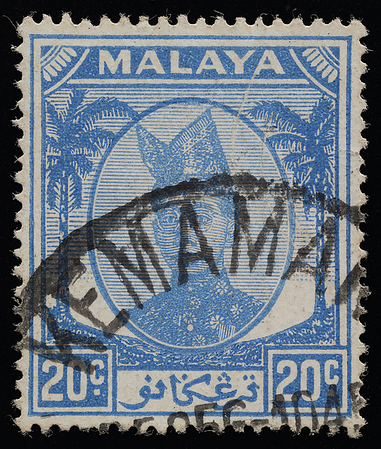 A similar "mutant" vignette exists on some 50-cent values in the same series (right). 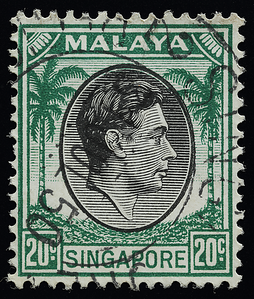 In lieu of chemical analysis, the author speculates that the greenish colour may be due to hydrated copper nitrate occuring as an impurity that becomes visible as the black pigment fades. This is known to happen in body tattoos. 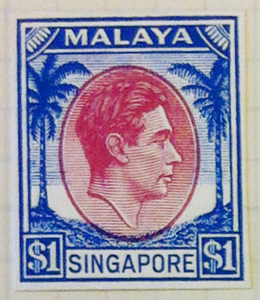 A mysterious copy of the $1 with a missing vignette was reported by Flowerdew (2002); a $5 in similar condition is shown on the left. The author was unable to make the vignette disappear from the $1 on the right despite immersing it in water for a year. 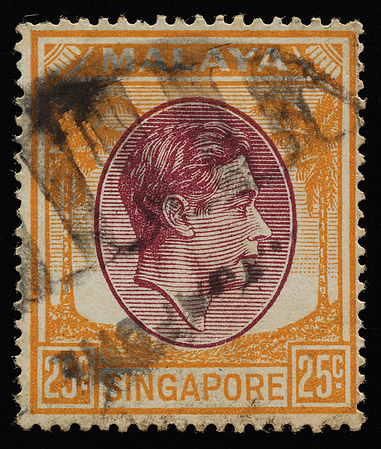 The author suspects poor ink and/or bleaching by chemicals such as the benzene, carbon tetrachloride, trichloroethylene and hydrogen peroxide sometimes used by philatelists to remove grease, reverse sulphuretting and treat other damage. 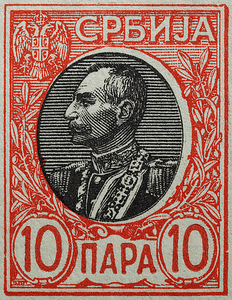 Three new post-war colour schemes that happened to match those of Serbia’s King Peter I stamps of 1905. 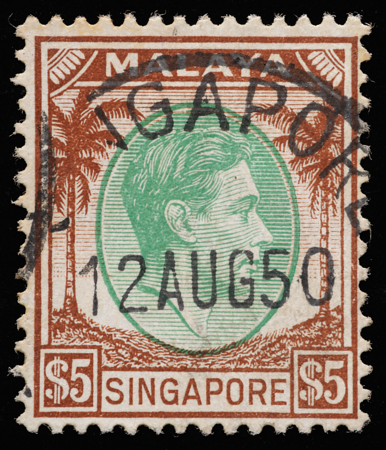 Left: the colours of Singapore's prestigious Raffles Institution. 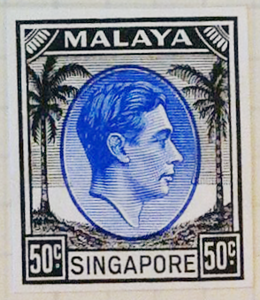 Centre: the 50 cents finally got the bicolour scheme that would have prevented the famous forgery. 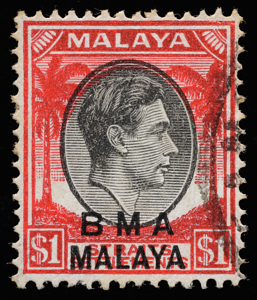 Right: the BMA $1, now printed on white paper instead of blue paper, lost its glamour. 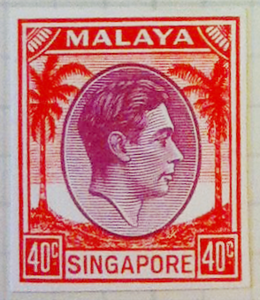 Two of the post-war dollar values sported colour schemes new to the coconut definitive, although the schemes first appeared in the 19th century. The earthy, botanical colours of the $5 set it apart from the bright colours of the other coconut high values. Tropical dipterocarp forest on the slopes of Singapore’s highest mountain Bukit Timah (16,300 cm). 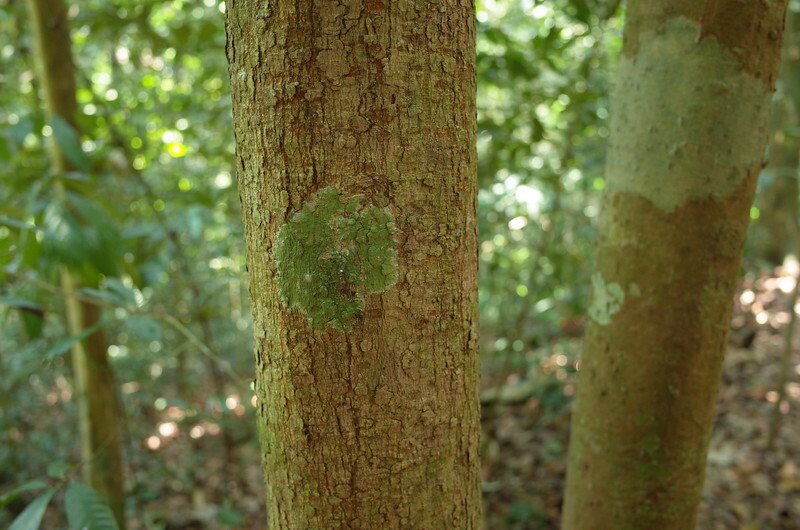 Can you see the $5 on the tree trunk? 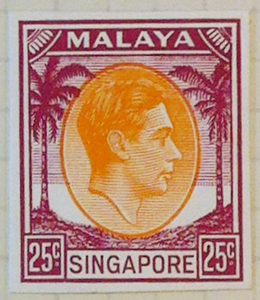 The purple-and-orange colour scheme had been passed from the 30 cents through the $5 to the 25¢. 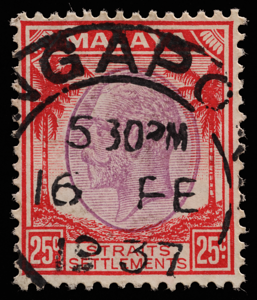 The postal authorities might have decided that the purple-and-orange colour scheme that the BMA $5 had inherited from the pre-war 30¢ really belonged to the 'middle-class' denominations. 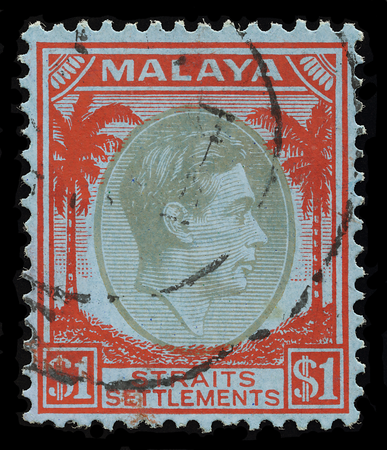 Among the proofs preserved in the Crown Agents, Philatelic and Security Printing Archive are unapproved reversed colour schemes of the post-war high values of the coconut definitives. Black tends to darken and desaturate other colours. 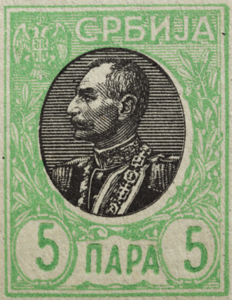 Using black for the head would therefore make it stronger, as in the case of the issued versions of the 20¢ and 50¢. 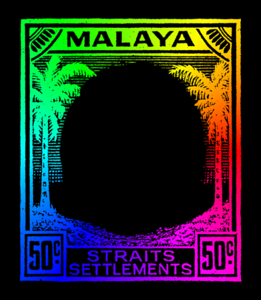 Elsewhere in the world, bicolours in which one of the colours is black usually have the black in the centre rather than in the frame. 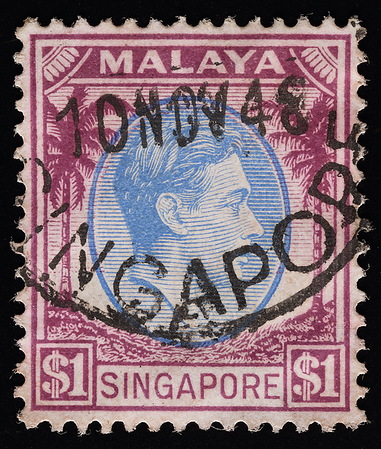 This can be seen in designs ranging from the Hindenburg definitives of Germany to the Australian kangaroos to stamps in the United States, India and the Polynesian kingdom of Tonga in the Pacific Ocean.